Iron Man and the C.S.A. Norman Osborn and Tony Stark have had their share of antagonistic moments over the years, certainly there's no love lost when these two go at it. And since Norman's appointment to the Director of the Thunderbolts program he's already had one run-in with Tony Stark and the Avengers. The Thunderbolts and the Avengers actually teamed-up along with the group known as Cyberforce to stop an alien hybrid (back in Fusion 1-3). But that collaboration was short-lived and Norman and Tony would soon return to their mutually disrespectful relationship. 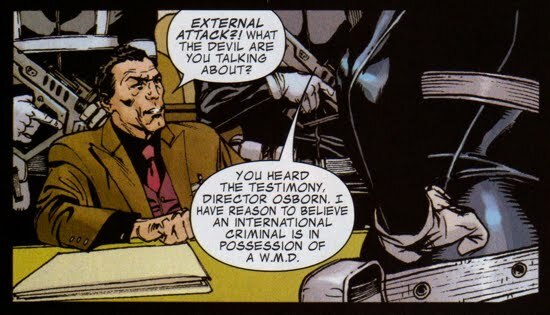 Osborn would find his way back into Stark's business when he served as a guest with the Commission on Superhuman Activities, which happened to be investigating Stark. Tony Stark was investigating Graviton's involvement in the death of the hero Gadget, he then presented his findings to the C.S.A. in Washington D.C. 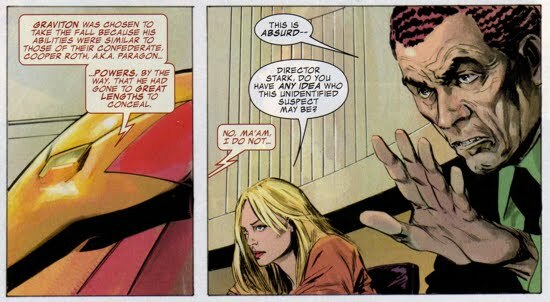 In Iron Man (V4) #23, Norman Osborn was present during Stark's briefing as Tony shared his theory that Gadget could have been killed by her own teammate Cooper Roth (aka Paragon). The C.S.A. was dismissive of Stark's claims and the committee suggested that this case should have been closed weeks prior. Norman plays devil's advocate to Stark and suggests that Roth could have been a 'boy unhinged' and that he may have been seeking vengeance for his friend's killer. Osborn is not seen again within the context of this case, so it is unclear what Norman's agenda was for his suggestion. He could just be trying to debunk Stark, its unlikely Norman was involved with this conspiracy. Norman continued to work with the C.S.A. in Iron Man (V4) #27, however now he has returned to New York City. In front of a United Nations General Assembly and the C.S.A., he and the Secretary of the Superhuman Armed Forces Henry Peter Gyrich interrogate Dr. Leonard Samson (aka Doc Samson) for his claims of a high level governmental conspiracy involving an 'extremis virus'. 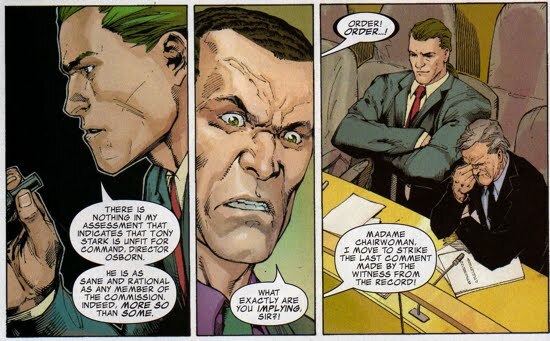 Osborn questions Stark's sanity to Samson and Samson immediately takes a shot at Norman suggesting that Stark is more sane than Osborn even if he's on a mandated psychiatric leave. Unnerved, Norman then suggests that Doc Samson may be involved with the disappearance of the Secretary of State Jack Kooning. Two important relationships develop in this brief scene, first, Doc Samson and Norman Osborn. The two will spare again soon after this back at Thunderbolts Mountain when Samson provides psychiatric care for Penance (aka Bobby Baldwin). While there, Samson eventually gets dirt on Norman as the Goblin (during the Caged Angels arc). Secondly, Osborn and Gyrich, Norman will later award Gyrich with a powerful position during Norman's Dark Reign. In Iron Man (V4) #28, Norman Osborn makes his last appearance with the C.S.A. 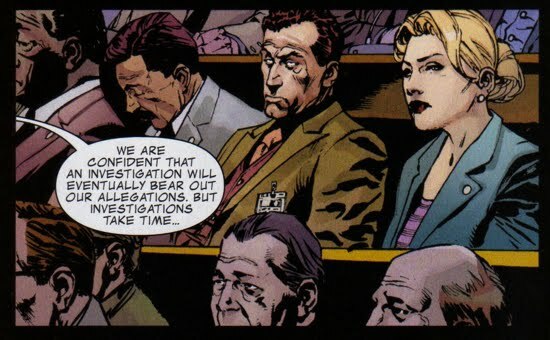 as the committee listens to Tony Stark's final comments regarding his recent transgressions. Chairwoman Valerie Cooper, alongside Osborn, soon announces that there is sufficient evidence to try Stark, Hill, and Dugan on charges of terrorism. However, before Cooper can finish her statement, S.H.I.E.L.D. agents blast into the assembly hall and whisk away Stark. Maria Hill claims that she, as the temporary director of S.H.I.E.D. (since Stark was terminated), was locking down the facility from external attack. Stark, Hill, and Dugan eventually walk, free of charges.